This year marks the 150th anniversary of the assasination of Abraham Lincoln. Being a Canadian, I wasn't really aware of the date, and I only knew slightly about the events that happened on the night of the 14th April 1865, the day that Lincoln was shot. When I received the opportunity to review With Malice Toward One*, a graphic novel that recalls those events and what ensued, I thought it would be a good way to learn about it. I wasn't really aware, but this graphic novel is aimed at American school kids, so they can learn more about their history. As Mike Person, the other writes about his book, he realized that what kids only seemed to know about Lincoln's assasination was that the President was shot at the Ford theatre and that he died the following day. Person wanted to tell the story with more details, so that the kids were more interrested about it. I realized that even though I'm not a kid anymore, I didn't really know more than the aimed public before reading it. The graphic novel is written in two parts, a novel one, and a graphic part that represents what was written in the previous part. For kids, this can be a great way to assimilate what was written, but it can be redundant for an adult. I guess you can also only read the written part on its own. I wouldn't read just the graphic part alone though. The events are related following the assassin, JohnWilkes Booth, for the most parts. It gives him a human quality, without excusing him from what he did. This gives the story an edge, as we follow him and one of his accomplices as they elope. At the end of the story there are a few comprehension activities.Those are always fun when you are young. 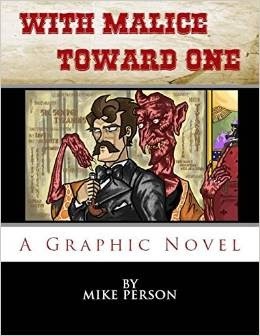 With Malice Toward One, by Mike Person, on Amazon.